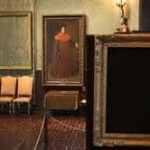 The Friday File: 25 years ago Wednesday, $500 million in paintings were stolen from the Gardner Museum in Boston, making it the greatest art heist. Other spectacular ones include the pilfering of the Mona Lisa from the Louvre in 1911 (recovered in 1913) and the purloining of Munch’s The Scream in 2004 (recovered in 2006). The true art isn’t stealing masterpieces, it’s unloading them. Absent clean provenance, it’s almost impossible.